Korean carmaker Hyundai, which has lost its position as the country's largest car exporter to Ford, will rework its growth strategy to continuously expand volumes in the domestic market. Unlike most other carmakers, who are sitting on a surplus capacity, the second biggest carmaker is facing a capacity constraint. It is yet to take a call on setting up a new manufacturing facility in India. "We are conscious of the growth of Indian market. We will continue to rework our production plans with a high focus on the domestic market. We will tweak the domestic and export strategy so that we do not lose volume or market share in India," said Rakesh Srivastava, director (sales & marketing) at Hyundai Motor India. The company, which has a 17 per cent share in domestic passenger vehicle market, is operating its plants at a 99 per cent capacity and has little headroom to expand production. It will, therefore, have to sacrifice export growth in favour of the domestic market. "I will react as the situation unfolds," said Srivastava and adds that the global markets are turning 'uncertain' and 'volatile'. "There are changes in norms across countries." The company exported 33,158 vehicles in the first quarter of FY18, declining more than 16 per cent to the corresponding period of last year. American carmaker Ford has exported 48,971 vehicles in these three months, clocking a growth of 54 per cent, Siam data showed. 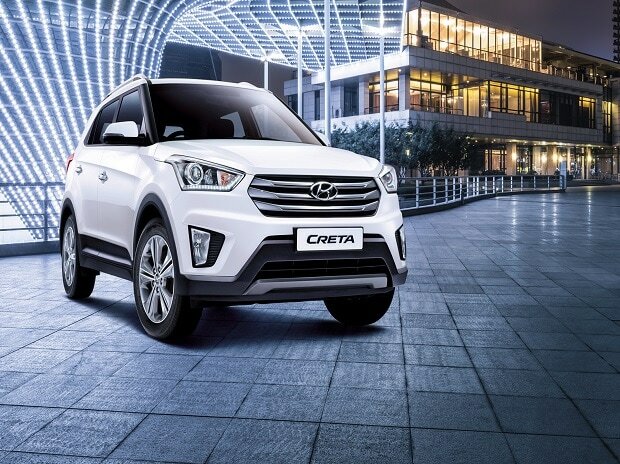 Hyundai's domestic sales grew 0.66 per cent to 124,327 vehicles during the April-June quarter as June volumes took a hit due to the goods and services tax (GST). For the full year, the company is eyeing growth of five-six per cent in the domestic market. The company has launched HyBuy, a referral programme for buyers who book a car online and refer it to friends and relatives. Hyundai said the company is well placed to emerge as a key beneficiary of GST. "We believe that Hyundai will be one of the largest gainers after GST. We have products ranging from Rs 3 lakh to Rs 30 lakh. While we were always strong in cars priced up to Rs 10 lakh, GST will increase our presence in the Rs 10 lakh plus segment, which now brings almost 20 per cent of our volumes through cars like Creta, Elantra and Tucson. The price drop of up to Rs 2 lakh makes the price value equation more favourable for these cars," said Srivastava. The company, which transports almost two thousand cars every day from its plants to dealerships and ports, said GST will bring a significant change in the time and cost taken by logistics. "I believe that there could be a reduction of 10 per cent in logistics cost going forward. The net benefit will go to customers," said Srivastava. Freight cost on a car ranges from Rs 10,000-14,000, the company said. He said GST has helped dealers to clear inventory to a large extent and released the blocked capital. "This money is now available for dealers to build inventory of fresh stocks that should lead to a good festive season demand for the company," he added.